When it comes to baseball cards, Mickey Mantle is king. He remains a cornerstone of any new release that he's in. His vintage cards from his playing days are among the most sought after in their respective sets. Even when ranked alongside the many Yankee greats, Mickey Mantle is the king of the hobby world. 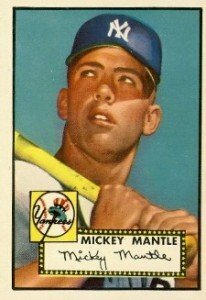 The 1952 Topps Mickey Mantle is probably the most famous baseball card released since the end of WWII. Other than the the T206 Honus Wagner, it's probably the most famous card of all-time. Vintage Mickey Mantle cards, not just his early ones, rank among the top cards of every set they're in. In some instances, veteran Mantles outsell rookies of Hall of Famers within the same set. Even after his passing in August, 1995, new Mickey Mantle cards have continued to hit the market. Topps, Fleer and Upper Deck have all had deals with his estate to ensure collectors are able to go after the beloved hero. Modern releases have focused a lot on autographs and memorabilia cards. However, even modern base cards and standard inserts command attention. Below is a real-time ranking of the 50 most-watched Mickey Mantle cards currently listed on eBay. The primary factor that influences an auction's popularity is the number of watchers it has, though there are some additional proprietary metrics that factor into the rankings as well. Great Unopened Baseball Card Packs From 20-27 Years Ago! FREE MICKEY MANTLE! 1956 Topps Mickey Mantle! Awesome Card Very Gradeable! 2001 Upper Deck Mickey Mantle Gold Glove Game Used Jersey Pinstripe!!!! 1961 Topps Mickey Mantle #300 Baseball Card PSA 7 Near-Mint! Nicely Centered! Unfortunately, not much. They can be found for under $5. I saw a Mickey mantle card that had a gold tiny to it. Just said MANTLE across the top and his signature in gold writing on the bottom. Said something like “94 legends” on the back. Any idea when this card is from? And what series?